AIIMS Director and noted heart transplant surgeon Dr P. Venugopal has got a fractured support from his 488-member Faculty Association for raising his voice against the undue interference of the Health Ministry in the day-to-day functioing of the institute. “Strong action” would be taken against indisciplined doctors in AIIMS, Union Health Minister Anbumani Ramadoss said here today while commenting on the bickering between the government and the AIIMS administration on the reservation issue. 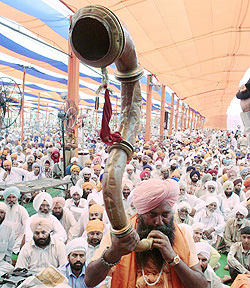 Tarn Taran was formally made the 19th district of the state to mark the 400th martyrdom anniversary of Guru Arjan Dev here today. The new district comprises of 493 revenue villages of subdivisions of Tarn Taran, Khadoor Sahib and Patti. Appearance of Mr Simranjit Singh Mann, President, Shiromani Akali Dal (Amritsar) at the SGPC, SAD (Badal) stage and his call for reviving much talked about Anandpur Sahib Resolution of 1973, in presence of his political adversaries — the national BJP president and Mr Parkash Singh Badal, SAD chief is likely to initiate political debate in the state. Cabinet Secretary B.K. Chaturvedi has issued a circular directing that Union ministers travelling abroad on official work should not be accompanied by their secretaries to ensure that senior officials are available in the Capital for consultations. Regional parties like the SAD and the INLD would have only 500 sqm in an institutional area in the Capital for its office following the Union Cabinet’s decision today. Samajwadi Party leader Amar Singh in his written submission before the Election Commission on the office of profit case contended that he did not drew any financial or other benefits as chairman of the UP Development Council (UPDC) to attract disqualification as an MP under office-of-profit rules for lawmakers. The Northern Command of the Indian Army has got embroiled in yet another controversy with a female officer shooting herself at Udhampur. Importantly, the officer was commissioned in the Army just about eight months ago.